Make a raspberry simple syrup (see recipe below) or buy some at a beverage store. Infuse with fresh thyme (sprigs and sticks) by muddling. Fill 8 oz. glass with soda water and ice. Add 2 TBS of the raspberry syrup. Garnish with a raspberry or two and a sprig of thyme. Make a lemon simple syrup (see above) or buy some at a beverage store. Infuse with fresh basil (use sprigs and sticks) by muddling. Fill 8 oz. glass with soda water and ice. Add 2 TBS of the lemon syrup. Garnish with small slices of fresh lemon and a basil leaf. Put all ingredients into a pot. Bring to a simmer on medium heat, stirring occasionally, until sugar has dissolved. Remove from heat. Let the syrup cool completely, then pour through a fine sieve into a jar or resealable container. You can use this simple syrup to make your favorite mocktail, or drizzle over fresh berries or melon. You can also use it to sweeten homemade popsicles or to make a Lemon-Basil Sorbet! Big shout out to Rochelle Hernandez for these fabulous concoctions! NCADD is committed to making our streets safer. for fatalities from drunk driving? All of us enjoy celebrating, whether it is dinner with extended families, picnics on holidays or office parties. For alcoholics, this often means an increased exposure to people who are consuming alcohol. 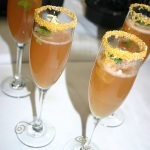 Mocktails are a proven prevention strategy, as well as a good, common sense approach to all festivities. People who don’t drink alcohol get tired of the same old soft drinks – usually served in a boring glass. They appreciate a sparkly beverage poured from an elegant punch bowl into a shapely, perhaps even frosted glass. 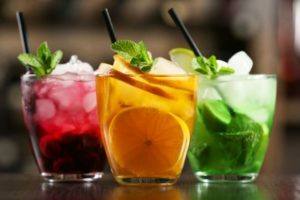 NCADD Sacramento has been sponsoring Holiday Mocktail Contests to provide delicious recipes to serve guests at home or in restaurants and bars. Take a look at last year’s contest!